This is a short story written for the official Stargate magazine. As several years have now passed, I can now release in here in full (see below: this is the unedited version submitted to the publisher, so you’re bound to find a few typos). The idea came about because of fan reaction to the newest member of the team, Vala Mal Doran. Now there was a character with baggage! While Vala’s relationship with the other team members was pretty clear-cut, what interested me was the dynamic between her and Teal’c. The situation I put them in to explore that dynamic came to me while I was writing Roswell. It also spun off another completely independent idea that led to The Bone Menagerie. Some years after writing this, when I’d moved to New Zealand, I was exploring the Waipara River. It’s one of the few places on Earth where the K-T, or more correctly in geological nomenclature, the K-Pg line is visible. 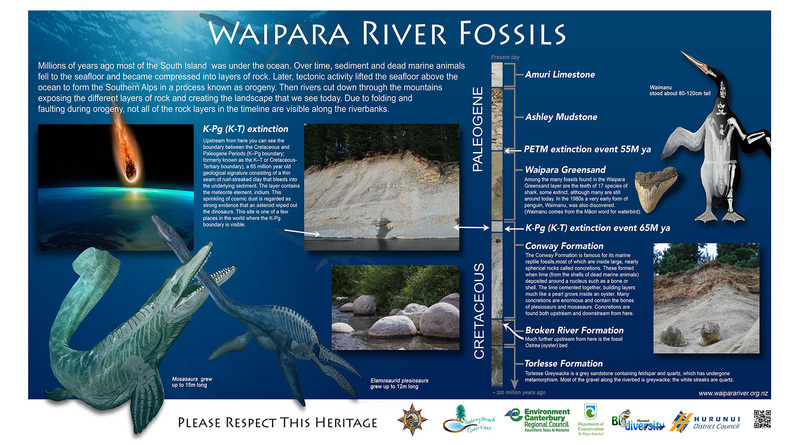 Part of my job as Biodiversity Advisor for the local council was to design a large interpretation sign for visitors. If you haven’t a clue what the ‘K-T’ means, this should help. “I can’t get a clear shot!” Mitchell yelled, bringing his P-90 to bear on Teal’c. Vala couldn’t see an immediate solution. Teal’c’s head, left shoulder, and arm were halfway down the throat of an animal that had snatched him up in its pointy jaws literally the moment the three of them had stepped through the Stargate. The one hope they had was that the indomitable Jaffa was gouging the beast’s iridescent eye with his free hand, and trying to rip its tonsils out with the other. Perhaps realizing it had bitten off more than it could chew, the motley-skinned monster abruptly dropped Teal’c—and then lifted a powerful leg with the clear intent of crushing him into the boggy ground. A short burst from Mitchell’s P-90 put and end to the notion of minced Jaffa for dinner. Enraged, the creature staggered back with an ear-splitting screech and then lunged at its attacker with powerful arms sporting six-inch claws. Mitchell unleashed another round, this time directly into the monster’s ugly lizard head, sending it staggering back into a cluster of tree ferns. Several high-pitched shrieks alerted Vala to the fact that the animal wasn’t alone, something that was reinforced by crashing sounds through the forest. With Mitchell right behind her, she raced across to Teal’c, who was trying to push himself to his knees. His arm and shoulder were a bloodied mess. Vala tensed, expecting to see the primordial forest dissolve and the safe, monster-free cabin of the jumper appear before them. She glanced back, as did Mitchell. It was only thirty feet to the gate, but even using the DHD hand device they’d acquired on their last mission wouldn’t help, because two of the monster’s brothers had smashed their way through the dense foliage and cut off their escape route. Fortunately, the monsters’ attention appeared to be focused solely on their mortally wounded sibling. Vala spied what the Colonel was indicating; half buried in mosses and ferns was a fallen tree trunk. About five feet in diameter and partially hollowed out by decay, it offered a considerably more defensible position. She let Mitchell take Teal’c’s weight and, recovering the Jaffa’s P-90 and slightly chewed pack, turned to cover their escape. Hoping she wouldn’t have to fire her weapon—certain it would only tick the creatures off—she waited until they were clear, and then turned to follow…just as the rest of the noisy, hungry, dentally over-endowed monsters burst onto the scene. Despite his shocking injuries, Teal’c stubbornly fought to remain conscious and was feebly attempting to reach for his weapon. “Hold on a minute.” Vala yanked off her own pack and rummaged around inside for the ribbon device. “Why do you assume this is my fault?” Locating the device, she tugged it out and slipped it over the fingers of her right hand. “Everything worked perfectly the first two times.” Detecting the naquadah in her blood, the device came alive while the neural interface in her mind awakened. Thanks to Dr. Lam’s brief course in anatomy, she’d learned to utilize the mental link that had been created between her and Teal’c to direct repairs in a prioritized rather than general manner. Such finesse wasn’t necessary for minor injuries, of course, but Teal’c’s heart had been punctured and he was bleeding out—fast. Ignoring the cherry colored froth bubbling out of his chest, she focused the beam on his aorta before turning her attention to the crushed tracheal tube and ruptured alveoli. With his life-threatening injuries taken care of, she expanded her focus to the rest of his body—and inadvertently her mind brushed his. Vala had been under the impression that Teal’c didn’t consider her altogether trustworthy, and so she was surprised when he made no effort to erect the psychological barricades he’d once used to protect his innermost thoughts from Apophis. Shying away from the mental intimacy, she turned her attention to stitching together the mangled bones and blood vessels. But she could not ignore the fact that by letting his guard down, Teal’c demonstrated a level of unprecedented trust. She succumbed to the temptation of wondering why, and was rewarded by a simple, incontrovertible thought; she had proved herself a worthy member of SG-1. A loud growl distracted her and the subtle mental connection was severed. “Hang on, we’ve got company,” Mitchell said, firing off another burst. “Precisely. I rest my bag.” She turned back to Teal’c and focused on the muscles and skin. The sooner she completed his healing, the sooner they could get out of here. Inclining his head in gratitude, he edged forward in the confined space to look outside, collecting his P-90 as he went. Vala tucked the healing device back in her pack, and moved up to join them. The remaining carnivores—she counted eight—seemed momentarily content chewing on the carcasses of their fallen comrades. There was just one teensy little problem; they were doing so directly in front of the Stargate. “Dinosaurs. This lot look like a cross between allosaurs and velociraptors.” He glanced down at the second, larger device on her left hand. The portable DHD device she wore—which had come into their possession during the Roswell jaunt—actuated the Stargate’s temporal properties. In so doing it had solved a puzzle that had apparently intrigued Sam since she’d first seen the device on the elderly Cassie’s hand. Dr. Lee had proposed testing it by using the time machine-enhanced jumper to guage its accuracy. Sam had agreed, conditional on them gating to a time that couldn’t possibly impact the present. They’d selected the date based on its nearness to an event everyone kept referring to as the ‘K-T boundary’. Vala hadn’t quite picked up the details of this presumably ominous incident, but Daniel had assured her that their mission would prove that the Antarctic Stargate had survived K-T. And in any case, they would see ‘it’ coming and have plenty of time to pack up and leave. Dr. Lee had become quite animated when the first test succeeded, because it demonstrated that ‘Cassie’s device’ compensated for a considerable degree of stellar drift; Earth having traveled some light years from its location in space in the intervening sixty-five million years. Daniel had been delighted because it had proved that the Ancients had been on Earth far longer than anyone had originally supposed. Vala still wondered why that was such a surprise, given that the Ancients had re-created all life in the galaxy following that suspiciously Ori-like incident with the plague. Teal’c had smiled and proclaimed Jurassic Park to be one of his favorite movies, his enthusiasm barely dampened when Dr. Lee informed him they were traveling to the Cretaceous, not the Jurassic—whatever that meant. Mitchell had whooped with childish delight, thrilled to learn he would finally see what colors dinosaurs. There was, Vala had decided after watching the reaction of the male members involved in this project, an abiding fascination with these eyesore creatures that apparently started when the men were small boys, and out of which few of them had completely grown. Even General O’Neill, whom they’d needed to operate the temporally enhanced jumper, had expressed enthusiasm for the tests, after receiving assurances that Antarctica during the Cretaceous was completely devoid of ice. “I can’t say I’m terribly taken with these eyesores of yours.” Vala shouted to make herself heard above the fight that had broken out over the creatures’ rapidly dwindling bounty. Everything had gone swimmingly when she’d sent the MALPs back, with the jumper beaming them aboard then returning to their own time to report success. The last test for the day involved a two-way trip via the gate. The jumper had supposedly been waiting in orbit to confirm their arrival and departure time and date, and act as a backup if something went wrong. She, Mitchell, and Teal’c had stepped through…and well, here they were. On the menu. Vala opened her mouth to reply when a sharp flash like lightning erupted across the horizon. The heavily oxygenated air around them seemed to fizzle and crack. Every animal and insect in the forest abruptly fell silent. A deep thrumming sensation quickly translated into a teeth-ratting vibration that caused the hairs on her neck to stand. It wasn’t merely fear, but a sense of abject terror, which, she knew from experience, was generated by sound waves whose frequencies were outside the audible range of hearing. Mitchell, who had nothing in his past to alert him to the imminent danger, started to move outside. Sensing what was coming, she yelled, “Cover your ears and duck!” Grabbing Mitchell by the arm, she pulled him back inside the dubious shelter of the log. Teal’c threw himself on top of them both. The shock wave, when it hit, wasn’t as bad as she’d expected. As with the Tunguska event they’d had the dubious pleasure of witnessing, the meteor—the explosion was far too small to have come from an asteroid—had most likely disintegrated before impact, and a considerable distance away. “I agree.” Teal’c had moved to the edge of their makeshift burrow. “You could say that,” Mitchell replied, wiping the crud from his eyes. A streak of fire flashed overhead. Then another, and another until the night sky was lit with a pyrotechnic display Vala had hoped never again to see. She’d witnessed one too many worlds destroyed this way, and as Mitchell had so graphically pointed out, it was never pretty. Something impacted the ground nearby. The resultant explosion ripped through the unnatural silence. She followed the direction of his gaze—and saw something crashing through the treetops heading in their direction. Which was all very well, except that it was aiming exactly for them—or more precisely, the Stargate. “Dial the gate!” Mitchell yelled, leaping out the way. She never got the chance. In fact, she wasn’t entirely certain what happened next, because just as she reached for the device, a massive detonation threw her to the ground and a wall of heat enveloped them. By the time she’d picked herself up out of the gory remains of their erstwhile attacker, a significant portion of the forest was on fire. The jumper, having plowed a great furrow through the forest, had slammed sideways into the Stargate, very effectively blocking any chance of escape. The jumper’s hatch opened and a wave of smoke billowed out just ahead of Sam, Daniel, and General O’Neill. Ducking a shower of burning embers, she couldn’t hear much above the continuous explosions and crackles of a nascent firestorm. “…partially embedded in the asteroid!” Daniel was yelling to Mitchell. “Vala, we’ll need you to dial home with Cassie’s device,” Sam said, shouting into her ear. Following Mitchell and Teal’c into the jumper, she was about to ask why when she spotted the blackened edge of the time-travel consol. “How did you get out of an asteroid?” Mitchell asked when Teal’c closed the hatch, shutting out the last of the noise. The jumper came to life. General O’Neill repositioned the craft while Vala dialed home. She was immeasurably relieved when the wormhole coalesced before them. “You mean it’s going to miss Earth?” Mitchell asked, taking a seat beside Daniel. “Nope,” Daniel said, exchanging a look with Sam. Outside, the light suddenly grew unbearably bright. The General retracted the drive pods and they sped into the wormhole, emerging seconds later in the SGC. General Landry was smiling down at them from the control room. Sam closed her laptop while Mitchell sat there like he’d been zatted. “What wrong?” Vala asked him.